So much sewing happened over the long weekend! And there's even a lot of sewn things to show for it! I brought my do. Good Stitches quilt to my mom's a while ago to get some nice photos, and she fell in love. The colors and shape and everything were just what she wanted for a wedding present later this year. Since I couldn't sell her that one, I started on another one. On Friday, I bought the fabric, cut most of the squares, and started on piecing HSTs. It's the Pyramid Scheme block from Fat Quarterly's Shape Workshop for Quilters, so there's two units of four HSTs that you make first, then piece together a larger triangle with two loose triangles and one HST. Here's a block from the finished quilt to give you an idea. My goal was to do just the two units of four this weekend, but managed to get all of it done! Last night I sewed all four sections together to make the centers of the blocks, and tonight I hope to add the four large triangles to the sides to bring them up to 12.5 inches. I'm really pleased with how easy it was to make all these blocks. I had that moment of realization when I counted how many HSTs I'd have to make (ten per block, 20 blocks in all, it's a fairly ugly number), but I tried out a new method for busting them out and it really paid off. What you do, is stick a piece of washi tape (or any tape) to your machine 1/4 inch from the needle. Then you line up the leading point on that line, and keep the trailing point on the edge of the tape. This gives you two seams, 1/4 inch from the center line, but without having to draw that line! Genius! I wish I remembered where I'd seen it first. 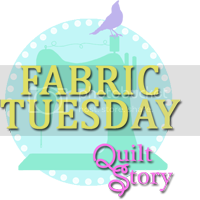 Linking up with Ms. Midge this week for Sew Cute Tuesday and Quilt Story for Fabric Tuesday!